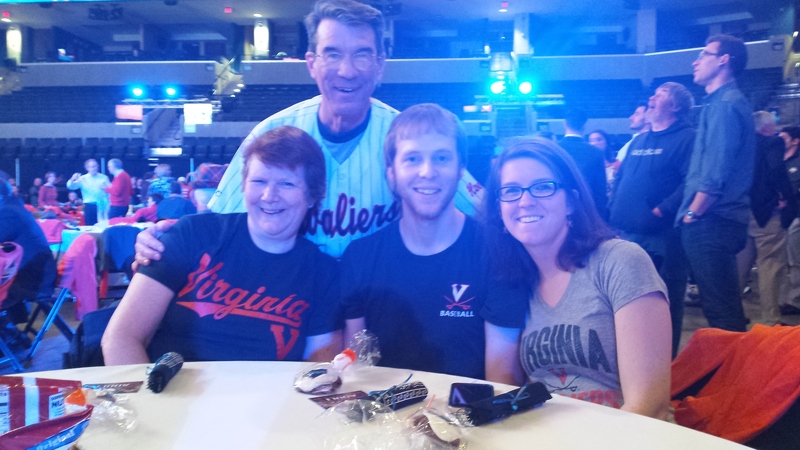 Last night, that is to say on the evening of January 30th, Martha, Becky, Jesse, and I had the pleasure of attending the University of Virginia “Step Up to the Plate” banquet. This is an annual fundraising affair for the Cavalier baseball team, and last night’s was particularly special as each member of the 2015 College World Series (CWS) championship team was presented his ring. Approximately 1,000 people were spread out at tables across the John Paul Jones Arena and enjoyed a meal of ballpark food including hot dogs, chicken fingers, and some delicious barbecue. 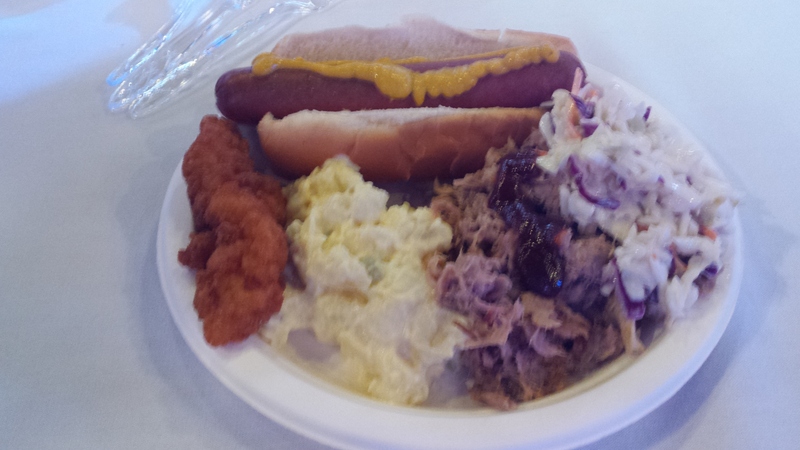 (Regular readers of this blog know that barbecue is often a part of my baseball adventures!) A wide variety of people were in attendance from elementary-aged children to grandparents. Over 50 former players were there including a gentleman who graced our table and played shortstop for the Cavs in the ’60s, and Tyler Wilson, who on this February 18th, will report to Sarasota, Florida in an attempt to earn a spot in the Baltimore Orioles’ rotation. The Cavs have a very supportive and enthusiastic fan base who were actually rooting and cheering during the showing of the CWS highlights, even though they obviously knew the outcome. Head Coach Brian O’Connor received a standing ovation upon being introduced and he delivered a speech of sincere thank yous and of admiration for what his ballplayers had accomplished. He emphasized that they had learned a valuable life-lesson during the season, which was the ability to overcome adversity, citing a stretch during the season when the team went 17 -18 and barely qualified for the ACC tournament. Finishing seventh in the conference tournament allowed them to barely qualify for the NCAA tournament, but at that point the team got healthy and hot, bringing a championship back to Charlottesville. (Ironically, the only game we saw last season had to be Virginia’s worst loss, giving up six runs to Duke in the 9th inning.) Coach O’Connor clearly emphasizes the development of his players as students: All six of the 2015 seniors graduated and 14 of the 2016 squad earned a place on the honor roll for the first semester. It is always rewarding to be a part, however small, of a group of people in a common cause, in this case supporting an amateur baseball team; winning a championship was really a bonus. The folks at our table were knowledgeable baseball fans with whom we soon bonded to the point that we received an invitation to tailgate next time we attend a game. Considering that they serve barbecue, we’re in! The Cavaliers begin defense of their national title on February 19th in Myrtle Beach, South Carolina against Kent State. The home opener is scheduled for February 23rd at 3:00 p.m. versus Virginia Military Institute. 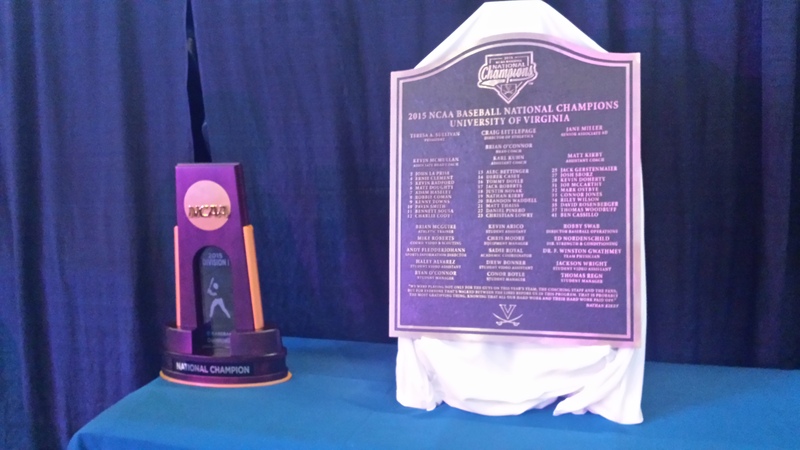 NCAA Championship trophy at left; commemorative plaque at right will be placed at Davenport Field for all to see. This entry was posted in Baseball in General, Uncategorized and tagged 2015 College World Series champions, Coach Brian O'Connor, UVA baseball, Virginia Cavaliers. Bookmark the permalink. Looking at the picture of the Four of you, it was evident that a great time was had last evening. The barbecue was Icing on the cake. Hopefully, Tyler Wilson will have a strong spring and be part of the rotation. We still are lacking a left handed starter which at this point should be a high priority. Our lineup is solid as usual, but as we both know, strong pitching will be the key to getting to October again. We did have a great time, Don. And yes, it always comes down to pitching and it will especially for the Orioles this year. Is Jesse rockin’ an Abe Lincoln type beard? Just one question Giz. Will the snow melt in time for the home opener? At this rate, it certainly will! Gotta be better than last year when the home opener didn’t take place until a month into the season.